WHERE DO PHORID FLIES NEST? Phorid flies are another small fly which can find it’s way into the home, although it is more of a problem in commercial kitchens and restaurants. 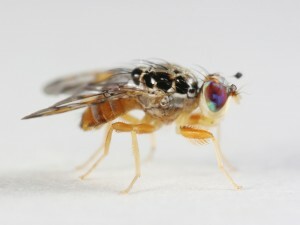 Phorid flies are small; they are about 1/8″ long. They are most commonly mistaken for fruit flies but resemble fungus gnats as well. Although their body is similar in color, phorid flies have a distinctive hump in their thorax which starts behind their head. This hump will vary since there are hundreds of subspecies in the phoridae family. They also lack the red eyes which fruit flies have. The other key to identifying phorid flies is how they move when you swat at them. Unlike other flies which will fly away, the first move a phorid fly will make is to run along surfaces away from you. This unique characteristic alone can be enough to identify them. Phorid flies take a longer time to develop than fruit flies. Although they can complete all stages in two weeks, it usually takes more than a month for them to go from egg to adult. Phorid flies need moisture to develop. They like to nest in drains, around leaky pipes and in the moisture which is formed around condensers of refrigeration units. I have seen several times where they have established themselves under a slab because a pipe had broken and was leaking water. Phorid flies need anything organic to survive and meat or garbage foodstuff is more than enough to allow them to prosper. Like most small flies, Phorid flies are easy to control and you have several products to choose from. The key to success is using the right one in the right areas of the home. So if you have phorid flies in a room or two, use a space spray known as PT-565. This product uses pyrethrin as the active and can be used throughout the day as needed. Treatments will only last 15-30 minutes but it will kill the active adults within a few minutes. Treatments should be done at least 2-3 times a day to insure you kill reproducing adults. And if you follow this treatment pattern, you should break their life cycle within 1-2 weeks so the inside population is eventually eliminated. The key to ending the cycle is to stay the course and treat frequently meaning several times a day for at least 2 weeks. The active ingredient in the PT-565 only lasts 15-30 minutes so you must reapply it over and over to insure you’re killing newly hatching adults. Failure to follow this schedule can allow the active adults to repopulate. Now if you aren’t able to follow this schedule, install AEROSOL 1000 MACHINES fitted with CLEAR ZONE FLYING INSECT KILLER. Basically these small machines will do the work for you by releasing a small, 1/2 second blast of pyrethrin from the Clear Zone every 15 minutes. To effectively use these machines, you’ll need to deploy one machine per 400 sq/ft of room. So if the problem is limited to just the kitchen or bathroom, one machine could be enough to knock them out. But if you are seeing the flies around the home at computer monitors, TV’s and other areas in the home, expect to need 3-4 machines. For example, the average 2000 sq/ft home would need 4-5 machines if you have a problem in every room. Each machine will need one can of Clear Zone. The active in these cans is similar to the PT-565 but about twice as strong. This is why only a little bit is needed and the small amount released every 15 minutes will be strong enough to control all flying pests like flies, moths, wasps, gnats, mosquitoes and more. 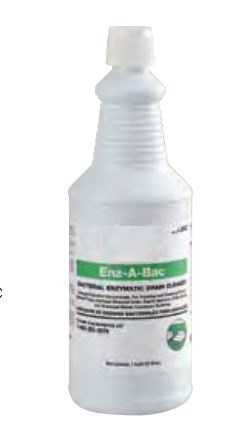 Clear Zone refills will last at least 30 days and should be kept active when flying pests are a problem. But when left running, they should be able to break the life cycle of phorid flies after 2 weeks. Since phorid flies like to live down drains, these areas must be treated too. First, use SURVIVORS once a week by pouring 2-4 down the drain late at night and letting it sit for several hours before running the water. Survivors will remove the grease and other natural organic material which commonly builds up in sink drains and by removing this buildup, you’ll be removing their food. 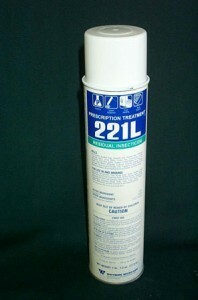 Next, on any night that you don’t use the Survivors, you should apply some PT-221 down the drain. Just 3-5 seconds of the spray down the drain will kill any developing stages. Do this late at night too so the treatment can sit overnight without the water running. Lastly, the FLY WEB FLY TRAP can be set up in any room and will help by collecting foraging phorid flies all day and night. This trap is easy to deploy and because it’s small, you can locate it in discreet locations.